The electrification of luxury SUVs. 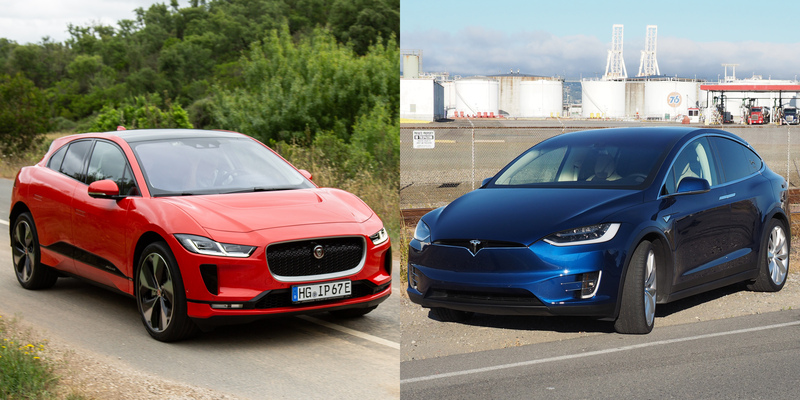 It's impossible not to compare the new Jaguar I-Pace with the Model X. They're currently the only members of the EV luxury SUV club. At least for now. BMW and Audi are both working on getting their electrified vehicles to market. But let's look at the differences between --not just two of the best EVs on the market -- but really two great vehicles overall. First off, if you're looking at either of these vehicles, you're doing pretty well for yourself. So congrats on getting that sweet job or having your new single blow up. Pricing out cars can be tricky because of trim levels, options etc. The base level I-Pace S, starts at $69,500. 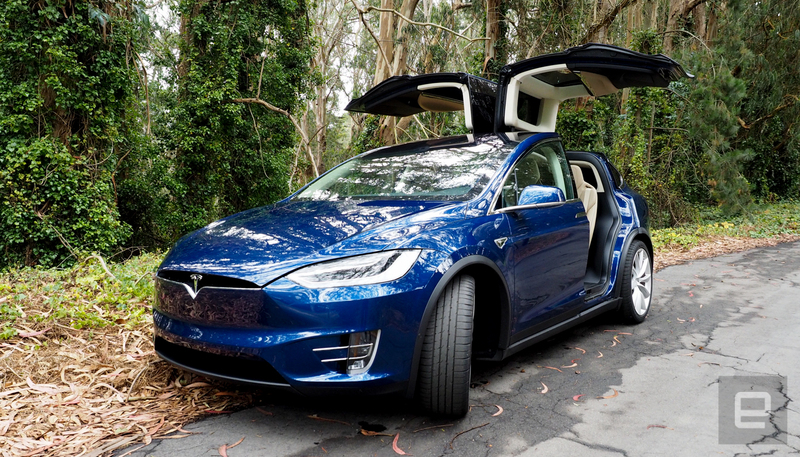 Meanwhile, the Tesla Model X 75D will set you back $79,500. This is our benchmark. From here you can add advanced semi-autonomous features, better rims, a nicer stereo, and on the Tesla, a more robust powertrain (P100D Ludicrous mode FTW). In the name of keeping things simple, we're comparing these two trim levels. So right off the bat, the I-Pace is $10,000 cheaper. If you care about price (and you probably do), that's a big deal. Next on the list of EV concerns, is the range. Tesla says that the Model X 75D will go up to 237 miles on a charge. According to Jaguar, the I-Pace will make it 240 miles before needing power. So really it's a wash. But when it comes to charging, Tesla has a leg up. The company has been building Supercharging stations like crazy. Plus, when you get to one of these stations, you know exactly the type of charger you're getting. The I-Pace supports up to 100kW DC fast charging, but those stations are few and far between. As for actual driving, both vehicles are AWD (All Wheel Drive) so that's great for cornering, rain, ice, snow and other road conditions. The I-Pace, on the other hand, has the power of sister company Land Rover behind it -- so if you're going to spend time off-road on rutted dirt roads, the Jaguar is the one to think about. Even if you're not traversing up gullies and through small creeks to get home, the I-Pace handles corners better. It feels lighter (they're both very heavy because of all the batteries) in switchbacks. I prefer a car that can tackle mountain roads and tight onramps as well as go fast. Oh, and they both go fast. The I-Pace will do zero to 60 in 4.5 seconds and the Model X 75D will do it in 4.9 seconds. Of course, you can get a faster Model X while the I-Pace's performance is static throughout its trim levels, but get ready to throw down some serious cash for the upgrade. 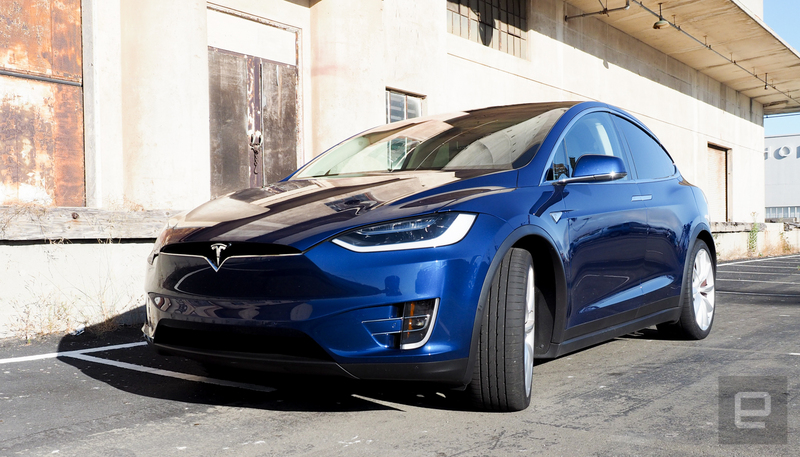 The amazingly quick P100D version of the Model X will set you back an eye-watering $140,000. It'll also push you back into your seat with a zero to 60 of 2.9 seconds. Sure it's crazy expensive, but it's awesome. The Model X also has an impressive infotainment system that's bigger than your first HDTV. It handles all the things you would expect, like media, navigation and finding a charging station. Unfortunately, it doesn't support Apple's CarPlay or Android Auto. The I-Pace's Touch Pro Duo spreads its controls over two screens and works pretty well (except for latency issues that occasionally pop up). Importantly, the I-Pace supports CarPlay and Android Auto (the first Jag to do so). Neither system is perfect and both have some great features and few shortcomings. My suggestion, if you're really into infotainment systems, is to go to both dealerships with your phone and try them out. While you're sitting in the cars, take in all the luxury. Both are deemed to be fancy and their interiors are a reflection of that. Let's just rip off the Gucci-branded Band-aid and say it, the Jaguar wins this comparison hands down. To be fair, the automaker has been defining luxury for over 80 years so they kind of know what they're doing. The Model X has a very nice interior and the automaker is making strides when it comes to designs, but it's not even close. The Jag is a Jag and they know how to make you feel like you're special when you sit in their cars. Then there are the semi-autonomous features. Here's a friendly reminder: there are no publicly available cars that drive themselves. Tesla is the clear winner in this field with the amazing Autopilot system. The automaker says that all the cars it's building have the future capability to drive themselves. Jaguar has a nice semi-autonomous system, but it's nowhere near as good as Tesla's. Finally, we get to the part that's really about how much you like doors that open like this: \_(ツ)_/. To me, both cars look great for their own reasons. The I-Pace reminds me of a high-end hatchback with a lift kit. I know that sounds horrible, but Jaguar pulled it off and I'm smitten with how it looks. Tesla went all out with the Falcon-Wing doors on the Model X and as someone that's always wanted a Mercedes-Benz 300 SL with gull-wing doors, I applaud them. I personally prefer the I-Pace. But that's me. You can stare at the photos of both vehicles and decide for yourself. So who's the winner here? Right now, I feel like Jaguar has taken what it's learned from its own history, from sister company Land Rover and from other automakers (including Tesla) and created the best luxury SUV on the road today. It just feels like a more polished vehicle and the $10,000 price difference is a nice bonus. But we buy cars based on emotion and if your heart says Tesla, you're not making a bad decision. They're both outstanding SUVs and they'll push other automakers to introduce even better cars both for the luxury segment and for the rest of us that still use the dollar menu as a major source of nutrition. The I-Pace and Model X aren't just great EVs, they're great cars and to get everyone on board for the transition from gas to electrons, they're exactly what we need.